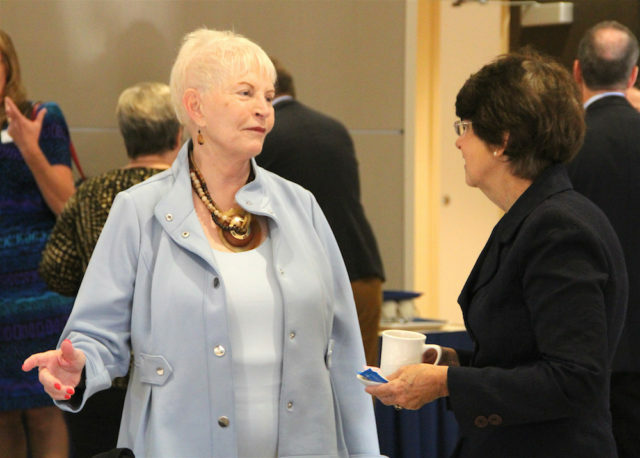 Almost exactly three years ago, representatives of the Sarasota County Schools and Sarasota County Government announced their planning for the combination of a new technical college and a new county library in North Port. 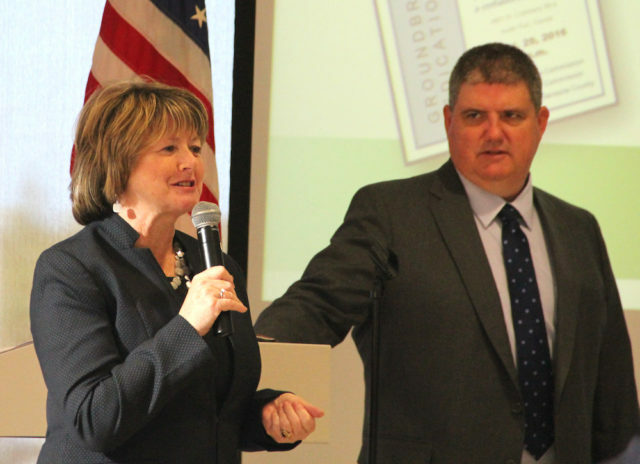 Flash forward to Jan. 20 of this year: Todd Bowden, who will become superintendent of the school district next month, and Sarabeth Kalajian, the county’s director of libraries and historical resources, spent about 30 minutes during the 2017 Convocation of Governments discussing the facilities that are expected to open in the fall. The meeting was held at the Suncoast Technical College in Sarasota. The total cost of the North Port facility is about $27 million, district Communications Specialist Scott Ferguson told The Sarasota News Leader. That encompasses funding from all sources, he said, and it includes the expenses for furniture, expenses and equipment. The county has contributed to the cost because of the library. A Jan. 3 memo to the County Commission also reported that the county had received another $500,000 state grant for the project. August is the target date for the opening of the North Port STC, “but that timeline could be affected by summer weather,” Ferguson told the News Leader in a Jan 24 email. Providing a bit of history, Kalajian talked of the initial correspondence she engaged in with district staff in 2013. When it became clear that the School Board was going to go ahead with constructing a technical college in North Port, she continued, “it seemed to be just the perfect combination, perfect timing,” to include a new North Port library in the plans. Bowden then pointed out that he immediately was drawn to the site that the district eventually was able to acquire. 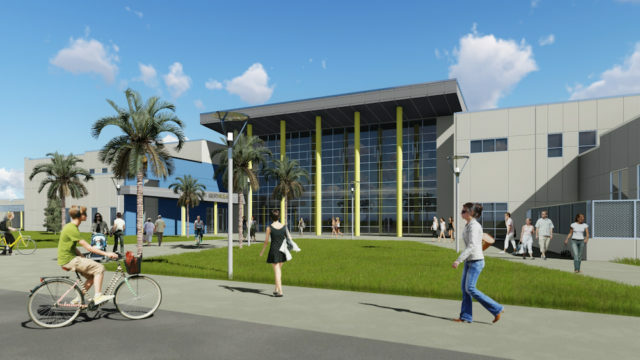 Having worked on a Hillsborough County technical center project whose location stymied its potential, he said, “I really had that mindset” that the new North Port Suncoast Technical College (STC) needed to be in a highly visible place. The site is located off Toledo Blade Boulevard, with easy access to Interstate 75, he pointed out. “It wasn’t the easiest site to acquire,” he added, because it was in foreclosure, and it was larger than the 25 acres the School Board needed for the new school. Yet, it met some of the most important criteria for the facility, he said, because of its high visibility from the interstate and its distance from the existing North Port Library. The project also will encompass a conference center, Kalajian noted, thanks to the City of North Port’s interest and engagement with the School Board and county staff. Over the previous week to 10 days, Bowden pointed out, vertical construction of the new STC has been moving along rapidly. 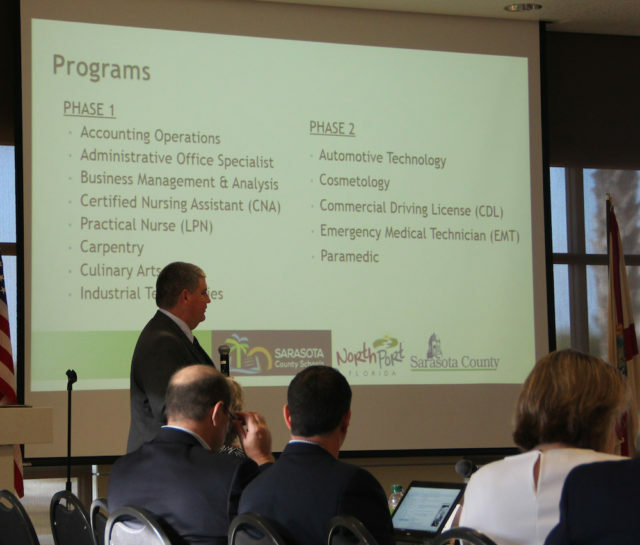 Regarding the programs for the new technical college, Bowden explained that whenever such a facility is in the planning stages, the goal is for its programs not to compete with those at nearby schools. In this case, he said, Charlotte Technical College is relatively close to the North Port site. Therefore, Sarasota School District staff took that school’s offerings into consideration when planning for the North Port STC. Others on the list are Certified Nursing Assistant (CNA), Practical Nurse (LPN), Carpentry, Culinary Arts and Industrial Technologies. 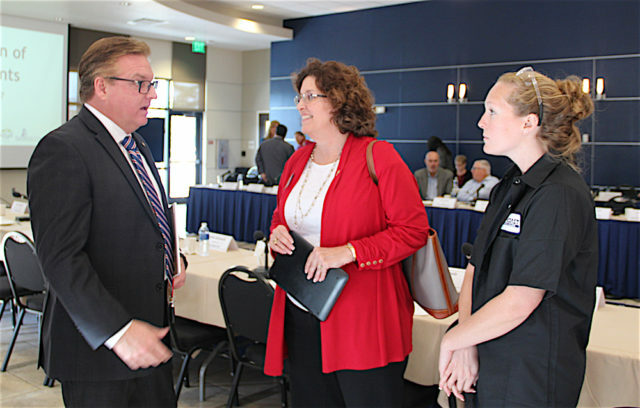 Regarding the Industrial Technologies program, Bowden explained that manufacturers “do not operate without an industrial maintenance department.” The appeal of such a program from the standpoint of a technical college, he said, is the ability to provide cross training. To work in industrial maintenance, he said, “you have to know mechanics; you have to know hydraulics; you have to know how to weld.” The shop on the North Port campus will teach a variety of trades, he pointed out. The Culinary Arts program originally was planned as part of Phase 2, he continued, but, because of the conference center, it was moved to Phase 1. “This morning’s meeting wouldn’t be nearly as fun without a little treat for you as you arrived,” he noted, referring to the pastries, fruit and beverages the Sarasota STC’s Culinary Arts students had provided for the attendees. 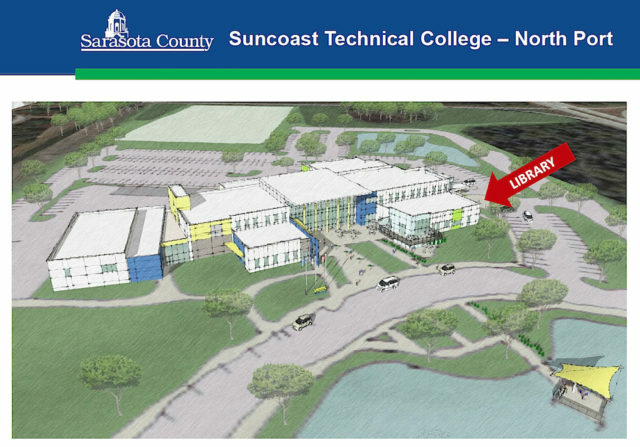 Regarding the features being planned for the Shannon Staub Public Library within the new Suncoast Technical College, Kalajian said that as a result of meetings with community residents, the facility not only will offer more meeting areas but it also will have the first “maker” space in a county library. That section will offer a lot of flexibility to users, she added, and it will have equipment and resources on hand that the average person cannot afford to purchase. Because of the library’s location on the college campus, she noted, the hours “will be slightly different” than those for other county libraries: an earlier start and probably a later closing time. Programs for all ages will be offered, Kalajian said. Additionally, the Friends of the Library organization for the facility will have its own bookstore, which will operate in conjunction with the campus bookshop and a “grab-and-go” food section. Hiring of staff for the library will begin soon, she said.